This original recipe was created to utilise local apples and pears from Apted’s Orchard in Strathewen. It is a little spicy, a little sweet with just a hint of sourness from tamarind. Use it as a glaze on pork with some fennel seed, on a cheese platter in place of quince paste or to flavour boost your next casserole or burgers. Goes with – traditional pork, Chinese barbecued pork, steak, fennel and gamey meats such as venison and kangaroo, steaks and schnitzel. This delicious recipe is based on Nana’s recipe from the 1930s, spiced up for modern tastebuds with a lingering finish of chilli, coriander and curry leaves. Use in sandwiches, as a nacho sauce, to flavour meatballs, in soups, on burgers and frittatas! Goes with – burgers, lamb, beef, cheese, eggs and falafels. 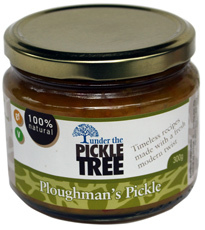 This is a pickle just like your grandma used to make but with a delicate twist of cumin and ginger to aid digestion. It is perfect teamed with a ham and cheese sandwich and beautifully complements sausages, corned beef and hamburgers. Goes with – cheese, corned beef, fritters and eggs. Pour over goat’s ricotta for an amazing dip! Goes with – prawns, salmon, trout, any seafood, brown rice, chicken, lamb and root vegetables. Use as a marinade or a dipping sauce! This elegant paste is a perfect marriage between Thai and Vietnamese flavours and combines lemongrass, chilli, garlic, fish sauce, coriander and kaffir lime. Mix with coconut milk for Thai chicken or prawns or with dark soy sauce for a Vietnamese spice rub on pork. Goes with – prawns, salmon, chicken, pork. Toss through Japanese soba noodles as an Asian pesto or combine with chicken stock and coconut milk for a hawker-style Asian soup. This popular curry paste from the south of India is rich with peppercorns, ginger and cloves and marries perfectly with tomatoes for a flavour-packed curry sauce. Use it for a slow-cooked lamb curry, as a spice rub on lamb cutlets, or a spice rub for roasted cauliflower. It is a vegan paste and also makes an excellent vegetable curry. Goes with – lamb, cauliflower, tomatoes, spinach, natural yoghurt, lentils and fish. This sweet and mild curry is popular throughout South East Asia and goes perfectly with fish and chicken. The hint of cinnamon means it is ideal for introducing children to their first curry and has made it a family favourite among Under the Pickle Tree's customers. Goes with – seafood, slow-cooked chicken, potatoes, sweet potatoes and peas. A classic and versatile Thai curry with a complex array of spices and a twist of kaffir lime and white peppercorn. Team it with coconut cream for a traditional chicken or pork curry. Use it to make Thai fish cakes, as a spice rub on beef or team with coconut milk and chicken stock for a laksa-style soup. Goes with – seafood, pork, beef, coconut and chicken. This fiery curry paste is hot enough to make you sweat yet perfectly balanced so you can taste all of the essential elements. It is always best with a classic Thai chicken curry using just a third of the jar with two tins of coconut cream! Goes with – chicken, noodles, fish balls, Thai eggplant. This vegan version of the original Lemongrass Paste has simply omitted fish sauce. To replace the seafood flavour simply combine this paste with some miso paste. Use for stir fries, marinating tofu and tempeh, as a pesto through rice noodles and combined with coconut cream for a simple simmer sauce. Goes with – all vegetables, miso paste, mushrooms, tofu and tempeh. Previously only Indian curries were suited to vegans but Under the Pickle Tree has taken a classic Thai curry and adapted to it vegans by omitting the shrimp paste and adding tamarind. The result is a complex and slightly sour Thai curry best teamed with coconut mild to lend it sweetness. Goes with – pumpkin soups, vegetable curries, a marinade for roast vegetables. These classic cucumbers are made to an heirloom recipe that dates back hundreds of years using premium white wine vinegar and select spices. Made only in season with the crispest Lebanese Cucumbers they sell out fast! Goes with – cheddar cheese, steak sandwich, burgers and smoked salmon. Made with a tangy blend of coconut water vinegar, lime, chilli and fish sauce this a fantastic salad dressing for Asian slaw and noodle salads, as a dipping sauce for rice paper rolls and Thai fish cakes. Goes with - Asian salads, all vegetables and white meats. Spicy, tart and full of Thai basil this is essentially all the flavour of pad Thai in a bottle. Use as a spicy salad dressing, as a marinade for seafood, poultry and tofu or as a dipping sauce for samosas! Made with tamarind, chilli, fish sauce and Thai basil it is wickedly good! Goes with - seafood, duck, chicken, tofu, noodles. Anything you like really!